A video has been going around online, and it happens to be one of the most profound videos that have involved portals and frequency. The video offers numerous types of confirmation about frequencies of a city along with the fact that it is possible to open up a portal using sound frequencies. There are skeptics who have said that the video is nothing more than a hoax but the evidence and synchronicity presented has many others believing that it is true. The person talking about the video said that they had booked a trip and was Sedona a couple of days ago so that they could be there on 11-11 this year. Secondly, they pointed out that they did have confirmation from a friend of theirs that this is just is looks like when a portal has been opened as that person did it. VIDEO TALKS THROUGH HOW TO OPEN UP THE PORTAL There are some factors that might not be entirely clear when watching the video and one of these is the significance that 525 Hz has and what two tones had been used, along with the question of whether there was a crystal in the speaker box that light was going through. There were plenty of questions asked, including whether the person would be able to do it on a live stream on Facebook or whether or not they had tried to stick anything through the portal and if so what and what happened? Of course, when watching the video doubt does come to mind as of course, this is something extraordinary that the human mind is not used to seeing. Bear in mind though, that if anything, the video does seem to reveal just what it would be like to open up a portal. The video is entitled Gateway to Sedona, and it starts off with the person explaining that they have opened up a sound tone generator on a webpage and that the tone is set to 528 Hz. 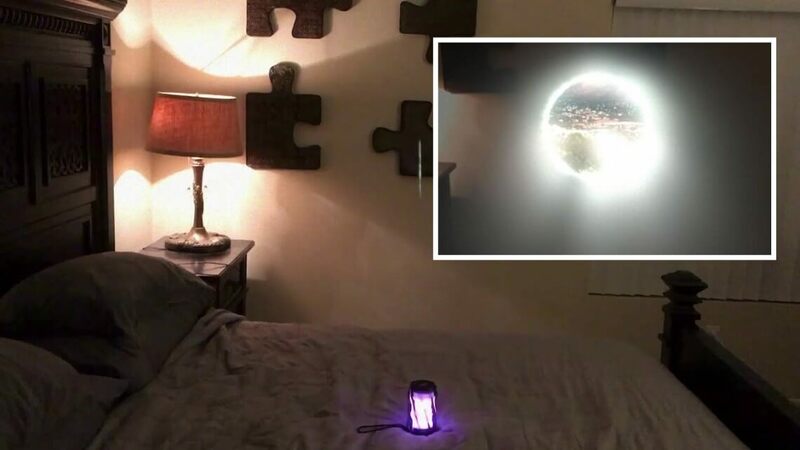 The video then pans around to the bed where there is a speaker/light on the bed. He explains that he has another sound generator opened in the browser and this is set to 525Hz. The man then goes on to start the sound generator and then turns to look at the speaker in the middle of the bed and says that there is some fluctuation. There then seems to be a small thin sliver of light appears above the light on the bed and this gradually glows and opens up into the portal. Looking through the portal, there is houses and fields along with trees and the man says that it is Sedona, which is a well-known vortex phenomenon and there are several of them. The man says that viewers are looking at a gateway or wormhole to Sedona using a mixture of two sound generators. Some people have been excited by the video and were impressed but others not so much so. But do you believe that the man managed to open up a portal in his bedroom using sound frequency or is it just another hoax?